"Nish, nish, ram, ram, nish, nish, ram, ram." Srila Prabhupada once imitated how we sometimes chant without focus, without concentration, without proper pronunciation - how we chant when we don't feel like chanting. You know the mood behind this type of chanting; "I have to chant but I'd rather be doing something else." And in our minds we are thinking, "I can't wait to get these rounds out of the way, when shall I be finnished." We all do this. And it can get pretty bad. I know devotees who chant rounds while watching football games on TV. Srila Prabhupada explained that this type of chanting is more or less useless because it will not produce the desired result, love of Krishna. To even call this chanting is a stretch. It is closer to a ritual. 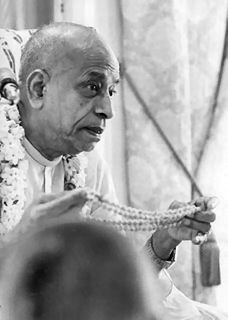 But Prabhupada acknowledged the value in the ritual by saying that although this kind of chanting is not very productive, at least those who are chanting this way are keeping their vow to chant. I call this kind of japa, "courtesy japa." "Courtesy japa" means that since you have taken a vow - either to your spiritual master or yourself - to chant a certain number of rounds daily, you keep that vow while chanting the kind of japa I described above. Here are a few other examples (methods) of what I call "courtesy japa:"
Chanting while watching movies (Krishna Conscious movies are included in courtesy japa). Chanting a little, talking a little, chanting a little, talking a little (sometimes known as jibber japa). Note, these are all excellent ways to ruin your japa and thus put your Krishna conscious transmission in park. You can make incredible advancement during japa. Good japa is like flying down the highway in fourth gear. Good japa produces inspiration, realization, detachment, increased desire to serve, attraction to study scripture, and an ability to see maya's workings more clearly. And there are so many more gifts good japa delivers. Yet we deprive ourselves of these gifts when we chant "courtesy japa." THE NEW MANTRA IS "DOWN WITH 'COURTESY JAPA'. "Courtesy japa" is like shooting a gun with blank bullets. When the trigger is pulled it just sounds like a bullet is being fired. Obviously you can't win a battle firing blanks. Similarly, "courtesy japa" sounds like the Hare Krishna maha mantra but it is just an artificial sound, a shadow of the real thing. Certainly you can't win the battle with maya firing blank mantras. The problem is - and this is something we have to accept philosophically as well as practically - if you keep practicing to chant the wrong way, you'll continue to get wrong results. What's more is that bad chanting tends to produce more bad chanting. Let me say that in another way because this is really important. The more you practice the wrong way of doing something, the more it gets engrained/programmed within you and the harder it usually becomes to fix it later. THE MORE ADVANCED YOU WILL BECOME. Do you have a severe case of "courtesy japaitis" programmed into you? If so, ask yourself how you are going to kick the bad habit. This is an important question to answer, because good japa is one of the pillars of success in spiritual life. It's all about fighting apathy in our japa. As Lord Caitanya said, playing the part of a conditioned soul, "I am so unfortunate that I have no attraction for chanting Your Holy Names." So we have two choices during japa. One is to go with the flow and just let the mind wander. The other is to go against the flow and make a valiant effort to focus on the holy name and chant in a prayerful, devotional mood. That's not so easy. It takes effort. It goes against everything "courtesy japa" stands for. And this is not much fun for lazy japa chanters like most of us. After all, concentrating is hard work. Japa can be a creative time. Often when I chant I get all kinds of ideas. Also the many things I have to do in the day - and even creative ways of doing them - keep popping up in my mind (or should I say keep pooping in my mind). Don't dwell on these. If they come up, either neglect them (those good ideas will most likely come up later) or stop chanting and write them down so you don't have to think about them while you chant. How will you break the habit of "courtesy japa?" Krishna is in your heart and He will help you as much as you want to be helped. Krishna says from Me alone come knowledge, remembrance and forgetfulness. So He will show you how to become a master of japa or a master of "courtesy japa." It all depends on what you want. If you want to improve, He will show you when to chant (hint - early in the morning), where to chant (hint - where you are not distracted), how to chant (hint - in front of devotional pictures, tulasi, Deities, etc, not in front of a television or a non Krishna conscious magazine). So here's the exercise. Write on top of a piece of paper, How To Improve My Japa? Below that write the subtitle, Putting an end to "courtesy japa." Then make your list. 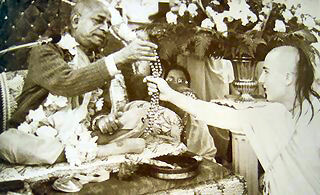 Let's put an end once and for all to "courtesy japa," the great enemy of Krishna consciousness. Without the holy name I would practically have no spiritual life, no real happiness, no intimacy with Krishna, no peace of mind, and no ability to control my senses. My entire relationship with Krishna, the most important relationship in my life, is revealed through His holy name. Without the holy name I would be lost, miserable, spiritually weak and destitute. Yet sometimes I treat this most valuable relationship as a botheration, something that gets in the way of me doing "more important" things or "more desirable" things. What helps me in these times is to remember that I get to chant, that I want to chant, that I love to chant (deep down inside). To think I have to chant reinforces the idea that chanting Krishna's lovely names is something I'd rather not be doing. After chanting bad japa for extended periods of time, bad chanting starts to become my default setting. I then believe that due to the circumstances I am in this is the best I can do. Bad chanting thus reinforces itself with more bad chanting. And since bad chanting produces little or no nectar or realization, becoming Krishna conscious becomes more of a pie in the sky ideal than a possible reality. Chanting thus becomes totally a matter of duty and can easily become automatic, heartless, and robotic. Bad chanting reinforces the belief that my chanting can't or won't get much better. The real problem is that I believe this and I am ok with this. My mind derives great pleasure from thinking. So I have a problem when I chant because while I am chanting my mind goes pleasure hunting and wants to contemplate so many interesting thoughts and not listen to the holy name.. This happens most often when I am bored with chanting. It is sometimes really difficult to just hear the mantra because my mind says, "This is not interesting. Think of something interesting, like, what you are going to say in your next class, or how you are going to do this or that project in new creative ways." My mind resists just listening to me chant because it's always looking for something to ponder, something to do. And when it starts pondering some interesting thoughts, even though my lips keep moving with the mantra, I disconnect myself from my chanting and live in my little mental dream world. I realize I often do this when I am bored chanting in order to "kill some time" during japa and keep myself entertained. After all, just thinking of the mantra and nothing else can sometimes be torture for the mind. To the degree that I give my all and all to my chanting, to that degree Krishna reciprocates and thus bhakti increases in my heart. As one popular song of the sixties said, "The love you give is equal to the love you take." What I put into my japa is what I get back. Devotion doesn't come back where devotion is not put out (garbage in, garbage out). My daughter is learning to play violin and to inspire her we watched a virtuoso eleven year old violinist on You Tube. This eleven year old was so good we couldn't believe it. As I watched in disbelief I thought, "If I took my japa as seriously as this kid takes her violin, I would be completely Krishna conscious by now. The reality is that if I only give 50% of my energy to my japa, then 50% is going somewhere else. If I want to properly chant and hear the holy names and reap the results that the holy name can offer, I need to give all my energy to my japa (both physical and mental). If I really value my relationship with Krishna, I will do this. And doing this shows Krishna how important that relationship is to me. Most of us who are raising families are challenged to find two undisturbed hours a day to solely focus on our rounds. 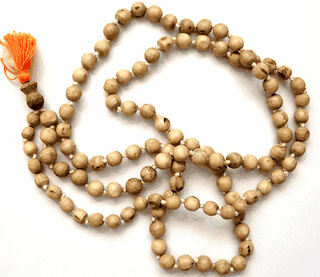 Yet many of the activities that take our time away from chanting are activities that we specifically have chosen to do. Afer the second retreat I thought that the reason I have so much on my plate that takes me away from chanting is simply because I don't like chanting enough. It's what Prabhupada calls the "self created burden." If I am finding it difficult to finish my rounds because of a lack of time, I am ultimately the one who chose to do all the activities that are getting in the way of my chanting. Even when I can't really avoid all the work and responsibilities, still I am the one who is organizing those activities in a way that chanting often takes a back seat to the other things I do. While I was chanting the other day, a truck drove by that was so loud that I couldn't even hear myself chant. As it got further away I could again hear the mantra coming out of my mouth. As this was happening I immediately thought that the truck is exactly like the mind. Sometimes the mind is so loud that I can't even hear myself chant. It just takes over and the maha mantra gets drowned out by the volume of my mind. When I think of controlling my mind, I think of turning down the volume on all of its chatter. Once that chatter stops, I can hear the maha mantra. When I constantly work on turning the volume down, eventually my mind starts to peacefully listen to the chanting. Too often I chant like a robot. Maybe someday things will get so bad that we'll have japa robots and we can just put our beads in their hands and they will chant to a recording of our japa. Although that sounds far fetched, I am like that robot. I have chanted Hare Krishna for so many years that I can do it my sleep, I can do it while driving, I can even do it while reading. I can do it while shopping, talking, sight seeing - you name it and I can do it and chant simultaneously. I am the acarya of multi-tasking japa. Chanting is so programmed into my cells that I can do it without even thinking about it. Someone might say, "Well that's good." No, it's horrible because I can do it without even being aware that I am doing it, what to speak of being aware that I am associating with Radha and Krishna. It's like someone shot Novocain in my heart and my heart has become numb and thus I am not feeling a thing while I chant.. Srila Bhaktisiddhanta said the name is not lip deep, it is heart deep. When I commit offences to the Holy Name, chanting becomes boring. In this consciousness chanting is tasteless, troublesome, and outright uninteresting, and it's the last thing I want to do. Thus I do it only out of duty while my mind is totally disengaged from chanting. My mood is simply to get my rounds finished as soon as possible. This is a sign to me that my spiritual life is lacking. When I don't do something to correct this, the bad chanting creates a domino reaction of less Krishna consciousness in my life, which then produces more bad chanting, which continues to produce less Krishna consciousness, which produces more bad chanting. And this could lead to something even worse than bad chanting. It could lead to no chanting. Prabhupada said the highest realization is to save yourself. I have so often neglected to chant well that I sometimes feel like I am dying of thirst for the nectar of the name. On the 64 rounds day (at the retreat, one day is reserved for 64 rounds and a vow of silence) I was finally taking the time to give myself the nectar that I so desperately needed. But because I had dried up so much over the years and thus was so thirsty, no matter how much I drank the name I still was thirsting for more. By the 64th round my thirst was just starting to become satisfied. 64 rounds is the most wonderful gift I have ever given myself. At least I should give myself the gift of 16 good rounds every day. Yes, the holy name does really work. Well, let me restate that: The holy name does really work if I chant the holy name the way the holy name is meant to be chanted. If I don't properly chant the holy name, then I start thinking the chanting can't really uproot my deepest anarthas. Because I am not experiencing Krishna while I chant, I lose faith in the value and power of the holy name. Going to the retreat and being facilitated to chant some really good rounds was a major faith builder. The holy name began to work on me more deeply than ever. It was real, vibrant, active, and dynamic, as compared to the usual dead mantras I chant. Dead mantras were producing a dead Mahatma Das. But the maha mantra is a living thing and when I chant a living mantra I get life. Although chanting revives our relationship with Krishna, chanting is also our relationship with Krishna. We are there with Radha and Krishna while we chant. Srila Bhaktisiddhanta said to welcome the holy name. Radha and Krishna come to me when I chant. Do I realize this when I chant? Do I welcome them and take care of them when they come? Do I worship them when they come? Or do I think, "Oh no, I still have six rounds left?" If I think this way, I simply take chanting as a process, a process that often I can't wait to end so I can get on to "more important" things. Poor chanting can actually produce misery, guilt, unhappiness, frustration, boredom, lack of energy and a host of other negative emotions and experiences. When I chant bad japa it doesn't make me feel like I am a blissful spiritual being; it makes me feel defeated for not applying myself. It also makes me both upset with myself for failing to come closer to Krishna and guilty because I know my guru expects more of me and I could do better. It leaves me entering my day on a failed note. Wow! The very thing that is supposed to make me so happy when done properly has the potency to make me feel awful if not done well. Hopefully I can take this misery as a kick in the rear end and let it push me into chanting better rounds. It's amazing how many bad japa habits I have not confronted even though I know how much these habits hurt me. They exist, I see them destroying my good japa, yet I ignore them. They have a tendency to somehow camouflage themselves in a way that says, "I am here but don't worry about me." And I believe them and think, "Ok, I won't confront you. Why? Am I afraid it will be too difficult or too much work to change? I must think it's less painful to change than to suffer the consequences of bad japa? I was forced to become fully conscious of these habits, confront them and deal with them at the retreat. This was one of the best things I've ever done. If I didn't do this, I don't know how long these habits would have continued to undermine my potential for better japa. What I do when I am not chanting affects the quality of my rounds. For example, if I am critical of devotees (or even of non-devotees), it will be more difficult to chant good rounds. If my mind is engaged in activities from morning to night that have nothing to do with Krishna, my attraction to chanting the next day will diminish. However, if I make an effort to be as Krishna conscious as possible during the day, my rounds the next day are easier to chant and more relishable. My activities today are linked to the quality of my japa tomorrow. One devotee told me that if he goes out and gives people the maha mantra, his rounds are always better the next day. When it comes down to it, all I want is to chant well, feel Krishna's presence while I chant, relish the nectar of the name, and be a servant of the name. Bhaktivinoda Thakura says there is nothing else in the three worlds but the holy name. Krishna has shown this to me by allowing me to observe other devotees' transformations (at the retreats) through good chanting. As their chanting improved, their desires changed. As they relished the sweetness of Krishna, they wanted more of it and realized this is all they really want. When Krishna is kind enough to give a drop of the taste of the nectar for which we are always anxious, we realize how much we have in our life that is not giving us this nectar (amrita-deathless) and how much we have in our life that is actually producing death. I once read a book in which a woman said that the walks she took with her dad when she was young were the most valuable moments in her life because she learned so much from him during those walks. I have always felt the same way about japa. My time with the holy name is the most valuable time of my day. Good chanting always gives me realization, strength, determination, and taste. Those two hours with the holy name is the most valuable time of my day, and to waste those two hours on bad japa is the greatest loss. Once I blow those two hours with bad rounds, that's it; I can't buy them back. Thus, I miss the opportunity to have Dad really and enlighten me that morning. Bad chanting is unacceptable to me. I now have set the bar higher and when I go below the acceptable level, red flags go off in my mind. Poor chanting is not making me Krishna conscious, so I reject it. The consequences of poor chanting are so undesirable that simply being aware of those consequences gets me back on track. I have accepted unacceptable japa too often-and that's simply not acceptable any longer. If it is acceptable to me it means I am satisfied with poor chanting and not overly concerned about doing anything to improve. And if I am not concerned about improving my japa, it won't get better on its own. How do I know I have chanted good rounds? One of the best indicators for me is that when I finish my rounds I want to keep chanting because I am getting such a nice taste. If I am relieved to put my bead bag down after my last round, that's an indicator that my chanting is not being done properly. Good chanting always produces a taste to chant more. 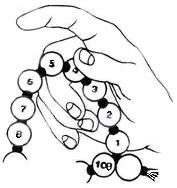 Prabhupada said sixteen rounds is the minimum; that constant chanting is the goal. Offer a prayer to the holy name that describes your aspirations to best serve the holy name, to go deeper into your relationship with the holy name. In order to help you with this exercise, I am including a prayer I wrote at the end of one of the Japa retreats. Please allow me to taste Your nectar, to fully experience Your presence, to feel joy and enthusiasm when I meet You. Please allow me to become attracted to You, to always hanker for your association, and to never become tired of spending time with you. And please reveal how You are non-different from your form, qualities and pastimes-how You are fully present in your name. * Please allow me to feel affection for You when I chant Your name. * Please allow my heart to melt (at least one time in my life) when I chant Your name. For more information on japa Retreats (five days) and Workshops (weekends), the dates for upcoming events, or how to bring a retreat or workshop to your area, please contact me at mahat@aol.com. I had the chance to attend a japa retreat held in upstate New York last spring. It was one of the first retreats to be held in North America as part of an initiative from Iskcon's SSPT. One thing I learned was a method of japa that originates from Bhurijana Prabhu. Yajna Purusha Prabhu, one of the instructors at the retreat, taught us the method. I have found this to be the best instruction I have come across to date in japa..and for that matter Krishna consciousness. The idea is that it is a doable request. If we tell the mind to hear 16 rounds of mantra, or even 1 round....the mind is to powerful to heed such a big request. But if we tell the mind "Just hear this one mantra..." we have it in our power to force the mind to comply to at least this small request. If the mind is really going wild and it wont even heed this small request, make a resolution to hear one half of a mantra. So request the mind to hear one (or a half) of the maha mantra...and that means to hear EVERY word in that mantra with no distraction. Once this has been completed (the hearing of one whole mantra, hearing every word of the mantra), repeat. Again tell the mind "hear just one mantra". Hear every word. Once this is done, repeat. Eventually the mind will succumb and it will hear one mantra after another. The mind will get absorbed in the sound vibration of the holy name. As the mind starts to become absorbed in the sound of the holy name, it will periodically rebel and try to drift to some other topic. So you must now neglect the attempts of the mind to deviate from the task of japa. It is like a child who wants something at the store...it will cry and cry, but the stern parent just ignores or neglects the misbehaviour. In due course the child will get the message and calm down. Similarly the mind will introduce so many ideas and rationalizations for thinking something else, but one must just neglect the mind and force it back to japa. Step 3. Take shelter of the Holy Name. Now the mind is absorbed in the sound of the holy name. One's whole existence is only the holy name....there is nothing else to be conscious of. So realize that the holy name is in fact Krishna Himself and surrender completely to Him, and accept Him in the form of the Holy Name as everything and all that we really ever will need. If the Holy Name so desires, being pleased by our endevor He may bestow His mercy upon us and give us a glimpse of real bhakti and the sweetness of His loving friendship. It really works! Hari Nama Ki Jay!